Sorry for the delay in my usual biweekly reviews - there has been a lot of crafting going on here at Tea Towers which has distracted me a little from writing up my usual blog posts. I'll try to drag myself away from all the crafting excitement to get my 'to blog about' pile under control. Not much in this month's issue of Sew Hip managed to hold my attention for very long. The smaller, quicker projects didn't really appeal to me as they were either too simple to really merit the instructions (like the coasters which were just wool beads threaded together) or far too advanced/time consuming for me to want to start. The duffle coat on the cover is very cute - but definitely beyond my beginner skills. I also liked the pretty patchwork throw but sadly I just don't have enough free time at the moment to start anything that large. The articles were quite interesting but more aimed towards the experienced sewer as there was a focus on tailoring and adjusting patterns to fit. I enjoyed the interview with founder of Craftsville which is a new craft website based in the UK that has recently been started. Craftsville is definitely worth taking a look at especially if you are a UK based crafter as they have up to date details of upcoming events. Ah - much better! 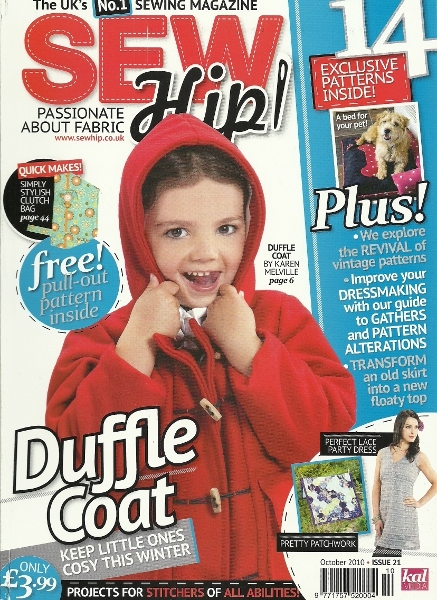 This issue of Sew Hip had quite a lot more in it that I enjoyed including a good few projects that I would like to try my hand at making. For me my favourites were the very cute little egg cosies that look so fun and quick to make, the pretty ruffled shoe clips that I could see being used on a number of different projects, the lovely fabric hampery baskets that would look so good with a pile of yarn in. The articles in this month's issue were also more enjoyable. The interview was with the Felt Mistress who makes some truly fantastic softies which are so unusual and full of character that they really don't fit in with traditional softies. There was also a piece on the curator of the UK edition of the Etsy blog which highlighted a few fantastic UK crafters which made for lots of drooling over photos of beautiful crafty goodies.